Fred Harvey Co. Materials from the DeGolyer Library is a subset of the items contained in the U.S. West: Photographs, Manuscripts, and Imprints digital collection that contains photographs, images, albums, and more, relating to the Fred Harvey Co. held by SMU's DeGolyer Library. Many of the Fred Harvey Co. Materials from the DeGolyer Library were annotated in 2013 by Carrie Johnston, an SMU English PhD graduate candidate whose dissertation, “Waiting, Working, and Writing Women in the Southwest, 1883-1939,” includes detailed research on the development of the Fred Harvey Co., its symbiotic relationship with the Atchison, Topeka and Santa Fe Railway (AT&SF), and its indelible impact on the growth of tourism and subsequent commercialization of North American Indian arts and crafts. Johnston's annotations are found in the Description field of the metadata pertaining to each item. Johnston's annotations are part of a Digital Humanities project with SMU Libraries. About the Fred Harvey Co.
British immigrant Fred Harvey approached the AT&SF in 1875 with an idea to open trackside eating houses along its expanding line. 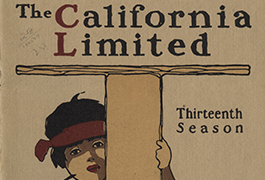 The novelty of serving fresh, edible food to travelers appealed to the AT&SF, which was ultimately looking to attract enough business to fund the line’s expansion all the way to the Pacific Coast. In 1876, the first Harvey House opened in the Topeka, Kansas train depot to instant success. The eating house’s popularity led to speculation that travelers refused to go farther than Topeka once they ate Harvey’s food, thus necessitating more Harvey Houses down the AT&SF line. In reality, the railroad considered the eating houses as an advertising expense, and “Meals by Fred Harvey” became the slogan by which the small railway competed for transcontinental business. Through the 1930s, the AT&SF funded Harvey ventures throughout Kansas, Colorado, New Mexico, Arizona, and California ranging from lunch counters to railway newsstands to luxury hotels. Fred Harvey died in 1901, leaving his hospitality chain to his son Ford. An enthusiast of the southwestern landscape, Ford began making plans to build a hotel along the south rim of the Grand Canyon. His sister Minnie and her husband John Huckel encouraged Ford to incorporate the arts and culture of North American Indians living near the Harvey hotels and restaurants to attract more travelers to New Mexico and Arizona. They established the Fred Harvey Indian Department in 1901, which hired Indian artist-demonstrators to weave blankets and make pottery and jewelry in an annex of the grand Alvarado Hotel in Albuquerque, New Mexico. 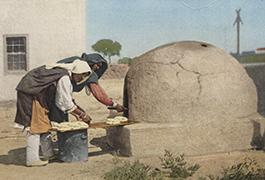 Although this practice is considered controversial, after the success of the Indian Building in Albuquerque, North American Indian artisans became central to Harvey and the AT&SF’s advertising strategies. 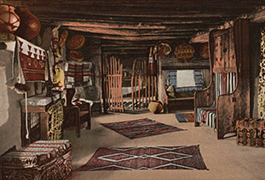 In 1905 they opened “Hopi House,” advertised as an exact replica of a Hopi dwelling. On the grounds of the newly-opened El Tovar Hotel at the Grand Canyon, the attraction featured “Harvey Indians” who sat on display, making their crafts as tourists looked on. The companies began offering Indian Detours in 1926, which took rail passengers in private “Harvey Cars” from rail stops in Albuquerque and Santa Fe into Indian Country to see beyond the staged artist-demonstrators and into Indians’ “real” lives. The all-female staff of tour guides wore the traditional Indian jewelry of squash blossom necklaces and silver concho belts, and the Detours’ official logo was adapted from a New Mexico cave painting of a firebird. Fried, Stephen. Appetite for America: How Visionary Businessman Fred Harvey Built a Railroad Empire that Civilized the Wild West. New York: Random House, 2010. Weigle, Marta and Barbara A Babcock, eds. The Great Southwest of the Fred Harvey Company and the Santa Fe Railway. Phoenix, AZ: Heard Museum, 1996. 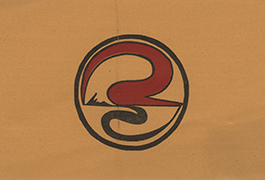 The Fred Harvey and AT&SF Railway items in the digital collection are samples of the promotional booklets, postcards, and ephemera that used the Fred Harvey Co.’s North American Indian imagery to promote travel to the Southwest. 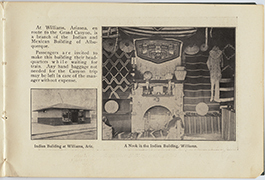 The materials were published between 1901, when the Fred Harvey Indian Department first opened, and 1930, when the Indian Detours business was sold to its founder, Hunter Clarkson. 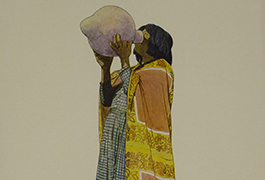 This promotional material not only encouraged travel to the Southwest, but also created an Indian craze in America, increasing demands for North American Indian souvenirs in the form of the blankets, pottery, and jewelry on display at Harvey locations.